Last year, my best friend and I shared an exciting phone conversation. My wife had recently discovered she was pregnant, and my friend had just purchased the new Toyota Prius Prime, so we shared our news excitedly with one another. The Prius Prime can run for up to 30 miles on a full charge, making it an extremely affordable car for local commuting. (Some hybrid vehicles, such as the Chevy Volt, can drive over 50 miles on a single charge.) My friend went from filling up his gas tank once a week to about once a month. Pure electric vehicles can have a range of up to several hundred miles. Of course, when you’re driving an electric or hybrid car, you need a way to charge the batteries. Most electric cars come with standard 120V charging cables that let you charge your car through a standard electrical socket. Unfortunately, charging a car this way can take several hours, especially if you’re driving a pure electric vehicle with a large battery. If you want to be able to charge your vehicle without having to leave it plugged in all night, you’re going to need to buy a charging station, or Electric Vehicle Supply Equipment (EVSE). But an EVSE isn’t something you’re going to want to buy without doing a little research first. An EVSE is not something you can simply plug in to your home. These charging stations run at 240 volts, which means they won’t be able to run off of your standard electrical sockets; they require a dedicated circuit. Because of this, you will likely need to hire a professional electrician to install your charging station. EVSEs are available in two different setups: plug-in and hardwired. Plug-in stations are generally easier to work with, but hardwired stations offer a cleaner install with less clutter. In terms of convenience and accessibility, plug-in installations are the clear winner. A plugged EVSE makes it easy to connect your vehicle to the charging station, and it also allows you to install or upgrade your equipment more easily. If your charging station fails or you decide to upgrade, you can do so without calling your electrician. The only real downside to a plugged in station is that you require a few extra pieces, such as a junction box. In addition, some electrical codes require homeowners to install hardwired charging stations instead. But if you’re looking for the install that gives you the most freedom and control, plugged in is definitely the way to go. Hardwired stations are just as the name suggests. The equipment is installed directly into your electrical system, so you don’t need a junction box or a plug to connect your vehicle with the station. On the other hand, if something goes wrong with a hardwired install or if you decide to upgrade to a newer model, you will have to seek out an electrician again. If you prefer a more direct approach, a hardwired EVSE may be the way to go. You should also be aware that some local codes require homeowners to employ hardwired stations. Another thing you need to consider is the amps you’re going to need, not only for the circuit breaker but for the EVSE as well. Each charging station is rated at a certain number of amps, usually between 30 and 40. In addition, every circuit breaker is designed to run at a certain level of amps. Because of electrical codes, any vehicle left charging for hours at a time cannot operate at more than 80% of the total capacity for the circuit breaker. So if your charging station is 30 amps, you would need a 40-amp circuit. If your charging station runs at 40 amps, you’ll need a 50-amp breaker. Some experts recommend buying a 50-amp breaker regardless of the capacity of your current charging station. Although 50-amp breakers can cost several hundred dollars more than a 40-amp breaker, your electrical system will be ready if you ever decide to upgrade. Most people don’t know what a NEMA connector is. When we think of a power plug, we think of just that – a plug. However, all electrical outlets in North America are NEMA outlets that connect with NEMA plugs. There are actually dozens of different types of NEMA connectors, although few of them see much use in mainstream circles. Nevertheless, many electric cars and EVSEs use non-standard NEMA connectors, such as NEMA 6-20 or NEMA 10-30. You’ll see these numbers used to describe different charging stations; these refer to the NEMA connectors the charging stations employ. That means that you need to make sure the EVSE has a NEMA connector that is compatible with your electric or hybrid vehicle. If you don’t have the appropriate NEMA receptacle at home, you will have to purchase an adapter before you will be able to use your charging station. Should You Buy an Electric Vehicle Charging Station? If you own an electric vehicle, buying a level 2 charging station is an excellent investment. But that’s exactly what it is – an investment. Most charging stations cost upwards of $500, and $700-$800 models are not uncommon. On top of that, you have to factor in the cost of an electrician, and you’re looking at well over $1000. There is a silver lining, however. You may have received a tax incentive from the government after you purchased your electric vehicle. Fortunately, charging stations are eligible for the same tax incentives, and depending on local tax codes, you may be able to receive hundreds of dollars back in taxes. The other factor is time. If you have a busy schedule or a long commute, waiting 8-12 hours for your car to charge simply may not be viable. Depending on your car battery, an EVSE may be able to cut the charging time in half, or even quarter it. Since cars perform better on a full battery, you’ll be able to make better use of your investment. At the end of the day, you don’t need an EVSE to charge your car. Your car will perform just fine plugged into a standard 120V outlet. But if you’re ready to make the investment, you won’t regret it. Bear in mind that the prices for each product reviewed below are based on a particular NEMA connector. If you select an EVSE with a different connector, the price may be different. The following is a quick reference that helps you compare at a glance all of the electric vehicle charging Station on this list. Picking the best charging station isn’t easy, but we believe the Siemens VersiCharge EVSE offers the best performance at the most reasonable price. When it comes to electric vehicle charging stations, $250 is definitely on the low end of the spectrum. But that doesn’t mean you still can’t get a great product for the price. The Zencar Level 2 Electric Vehicle Charger is one of the most affordable charging stations on the market. Zencar is available with two different plugs. It’s available in both the NEMA 10-30 and the newer NEMA L14-30, depending on what plug you used when you installed your charging station. The Zencar runs on 240V and is rated at 16 amps. This means you don’t need a more expensive 50-amp circuit breaker, but it also means your car battery won’t charge nearly as quickly. This charging station is compatible with almost every electric vehicle, so long as they meet SAE J1772 safety standards. The charging station can work at almost any temperature, from -22°F all the way to 122°. While temperatures that cold are not unheard of in the United States, your vehicle will be safe to charge in almost any climate. The charging station also features a number of protection safety measures. The EVSE is proofed against lightning, leaks, overvoltage and overheating. It is waterproof, although it is susceptible to flood damage if underwater for a sustained period, and offers UL94V-0 rated flame resistance. The charging station is backed by a two-year warranty. While this doesn’t have as much power as more expensive EVSEs, it is far and away more effective than a standard 220V plug, making this Level 2 charging station an excellent value. At 40 amps, the Jekayla Level 2 40 Amp Portable Electric Vehicle Charger offers significantly more power than the more modestly-priced Zencar charging station. Since the speed at which your vehicle charges is tied in directly with the amperes of your unit, the Jekayla charges 2.5 times faster than a 16-amp EVSE. The Jekayla uses a NEMA 14-50 plug and is compatible with all SEA J1772 compliant vehicles, although it does need an adapter to work with Tesla models. The EVSE runs on 240V and at 9600 watts is going to have a major impact on your energy bill, so be sure to charge it at night and avoid peak hours if at all possible. The Jekayla features a 16.4 foot cable, which is a little short, but extension cables are available for sell if that’s not long enough. The EVSE is waterproof and approved for use in all weather conditions, including blizzards. The charging station is backed by a one-year warranty for added peace of mind. Unfortunately, this charging station does not work with hardwired charging stations. If ratings and awards matter to you, then you might want to check out the Siemens US2 VersiCharge Universal EVSE. Rated the best charging station of 2017 by Wirecutter, this 30 amp, 240V charging station is easy to use and ready to go. Featuring the same NEMA 6-50 plug frequently used in dryer outfits, the VersiCharge is easier to install and operate. It comes with a mounting bracket that makes it easy to install in your garage, and it has a number of built-in timer functions that let you pause your charge or delay it by a certain number of hours. Manufactured in California, the VersiCharge is backed by an industry-leading three-year warranty and is compatible with all SEA J1772 vehicles, as well as the Tesla. The VersiCharge can be used with either plug-in or hardwired stations, giving you the versatility and freedom you need to fit your home and lifestyle. With an average charging time of just 3.5 hours, your car will be ready to go before you know it. The VersiCharge comes with a convenient 20 foot cable for more flexibility, and can be used either indoors or outside. How much is smart home compatibility worth to you? 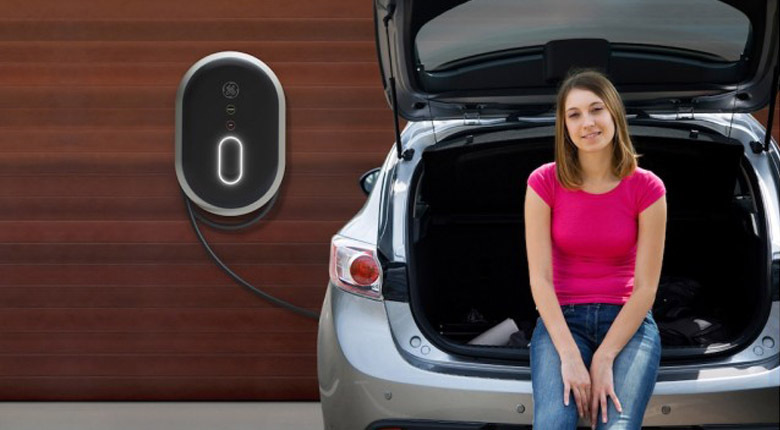 If your goal is to connect your entire home into your smart hub, then the ChargePoint Electric Vehicle Charger might just be the charging station you’re looking for. ChargePoint is compatible and ready to work with Amazon Alexa, so after you’ve set it up, you can turn the charger on and off with a simple voice command from anywhere in your home, saving time and money and bringing you more convenience. In addition, this allows you to track and monitor your EVSE through a smart phone app, giving you even more control over your EVSE. When it comes to power, however, this is not the best model. A 16 amp charging station, this won’t charge your vehicle as quickly as other models, and in terms of power, and there are a number of faster EVSEs available for less money. In addition, the ChargePoint is only approved for use with its own 12-foot power cable; the use of any other cable could void the warranty. Nevertheless, this charging station proves its worth by its smart hub compatibility. If you don’t use Amazon Alexa, there are more powerful charging stations that will net you more value for the price. But for those with connected smart homes, the ChargePoint is well worth the price. Like the ChargePoint EVSE, the AeroVironment TurboCord features a 16-amp plug-in charger designed to provide fast, convenient charging for all UL-listed vehicles. What sets the AeroVironment apart from other charging stations is that it comes with both a Level 1 and Level 2 charger, allowing you to charge your car wherever you go, whenever you go. When it comes to electric vehicle chargers, AeroVironment is one of the biggest names in the business, as they helped to develop the EV-1, the first modern electric car. So it goes without saying that the company makes some of the finest charging stations on the market. They back up this experience with an industry-leading three-year warranty, so you can depend on years of reliable performance. The TurboCord uses a NEMA 6-20 to connect to your plug-in station, and since it runs on just 16 amperes, you don’t have to worry about expensive circuit breakers. The TurboCard is rated for both indoor and outdoor use, and is both waterproof and ready to use in any weather condition. While there are faster charging stations available, the experience and provided warranty for the AeroVironment makes this an EVSE well worth the money. Being able to connect your charging station to your smart home is a valuable feature, and thanks to its compatibility with Amazon Alexa, ChargePoint WiFi connected EVSE chargers are some of the best chargers on the market. This is much the same as the 16 amp ChargePoint charging station, but features 32 amps for faster, charging and better performance. Since ChargePoint is compatible and ready to work with Amazon Alexa, it connects directly to your home WiFi network. With ChargePoint, you can activate your charging station on a word, or command Alexa to set automatic timers that charge your vehicle at a specific time each day or evening.. In addition, this allows you to track and monitor your EVSE through a smart phone app, giving you even more control over your EVSE. Thanks to a beefier 32 amp model, this is every bit the equal of competitor’s charging stations, although it’s somewhat more expensive. Nevertheless, this charging station proves its worth by its smart hub compatibility. If you’re looking for a fast charging station at a competitive price, there are better options for you. But if your home is connected through Alexa, this is the way to go. The JuiceBox Pro 40 amp charging station combines a fast, high-powered EVSE with a sleek, modern design that easily sets it apart from other models. Featuring built-in WiFi and optional voice command via Amazon Alexa, the JuiceBox brings your electric vehicle into your smart home while also providing an amazing amount of power than can charge your car in under four hours. Utilizing a NEMA 14-50 plug, the JuiceBox Pro offers a number of innovative features, including app and web-based charging control that allows you to set a schedule and watch your energy meter. It also offers real-time notifications, and LED charging light indicators let you know when the charging station is in operation. Because the JuiceBox Pro uses 40 amps, you will need a more expensive 50-amp circuit breaker. While this increases your installation fee, the improved charging speeds are well worth it, giving you more time to do the things that really matter to you. Yet another solid choice for an EVSE, the ClipperCreek HCS-40P EV charging station offers everything you need for fast, reliable performance. Using a NEMA 14-50 plug and running on 32 amps, ClipperCreek is a great choice for your plug-in charging station. The ClipperCreek has been safety certified and is guaranteed to meet all safety standards for your electric vehicle. Installing the charging station is a cinch, and absolutely no assembly is required. Just mount the EVSE to a wall and you’re ready to go. It comes with a 25-foot cable so you have plenty of pace to set it up, and it can be used either indoors or outdoors. The ClipperCreek charging station comes with everyting you need to mount it, and also comes with a space to store your cable when not in use. This even has a padlock, so you can keep your property secure at all times. The charging station is made in America, so you know it’s quality manufacturing you can depend on. Bigger and better than the less expensive AeroVironment charging station, this EVSE runs on 32 amps to charge your vehicle more quickly, giving you more time to do the things you love. Most charging stations are only available for plug-in stations, but the Bosch Level 2 EV charger is compatible with both hardwired and plug-in systems, giving you the versatility you need to meet any situation. The Bosch charger has a number of helpful features, such as an on/off switch to ease your energy consumption and a thermal sensor that wards off overheating. At 30 amps, the Bosch charges your car in about 4-5 hours, and it uses a NEMA 6-50 plug that’s standard with most electric dryers, making it easier to install. Backed by an industry-leading three-year warranty, the Bosch Level 2 charger Features everything you need to charge yor vehicle. Whether you have a simple plug-in charger or are required by electrical codes to use a hardwired model, you can depend on Bosch to meet your needs. Trying to find the right charging station to meet your needs can be a little tricky, but generally speaking there aren’t a lot of bad choices to be made. The most important decision you need to make is how many amperes you want to run, whether your system is plugged in or hardwired, and if you want to connect your charging station to your smart home. No matter what you need in a charging station, we’re confident you’ll find what you’re looking for here.